The Memphis Music Commission made her an “Emissary of Memphis Music” and her name was called in the Congressional Record. 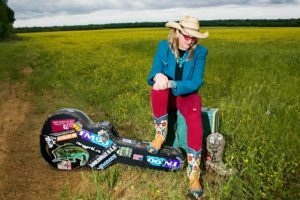 Albert King used to call her “little boss woman” and the iconic David Amram calls her “the soul of Memphis.” Nancy Apple is a combination of humbleness and hotshot, honesty and hyperbole… sinner and saint. She sings and writes songs… plays guitar, drums, accordion and harmonica. Her newest release, EP, will debut at WoodyFest and is an EP recorded and co-produced by Rob McNurlin in the living room of the housing project apartment Elvis lived in when he was 13-years-old.